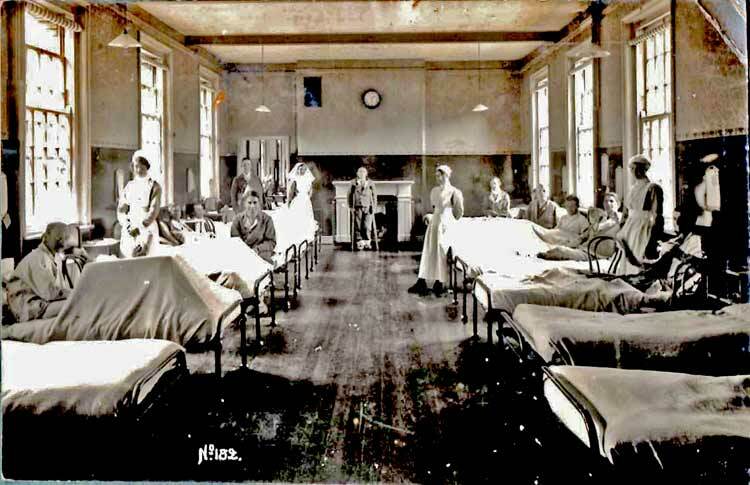 The Great War had hardly begun when it became obvious that there would be a need for more hospitals in England where wounded soldiers could be treated and then recuperate. 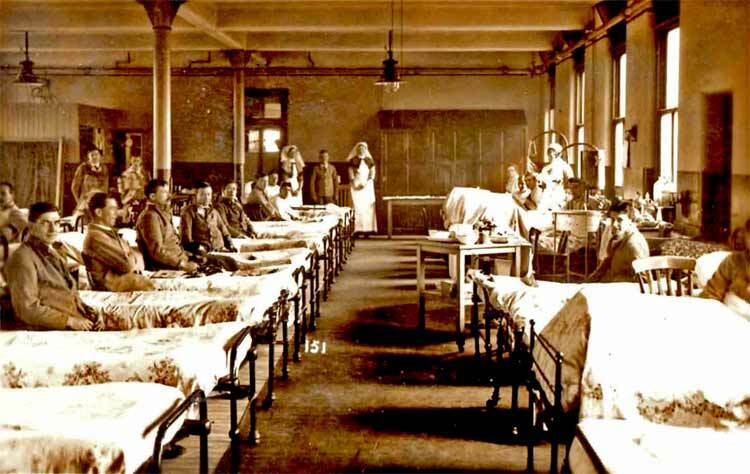 In those pre-NHS days, hospitals were fewer and those in existence could certainly not cope with an influx of wounded servicemen. Large numbers of the gentry saw it as their patriotic duty to help in the emergency and offered their mansions for use as emergency hospitals. The North Eastern Daily Gazette reported in the autumn of 1914 that Heanage Wynne-Finch, (the new Lord of the Manor of Stokesley) had offered Stokesley Manor House, his family home, for this purpose. (The Manor House in 1914 was twice the size it is today, having been substantially reduced in size by the demolition of four bays at its south end after the Second World War). As a hospital, Stokesley Manor boasted two wards and a total of 60 beds, but the new hospital needed nurses. Like many other "Base Hospitals", Stokesley was staffed by local Red Cross volunteers, under the leadership of the redoubtable Mrs Anne Gjers. The wife of Lawrence Gjers, the eminent engineer and industrialist, Anne was herself the daughter of a former Mayor of Middlesbrough. She had long been associated with North Yorkshire branch of the Red Cross, and would later receive an OBE for her work. In 1909, the British Government with the help of County Red Cross Associations had begun to establish a nationwide system of voluntary aid. Volunteers were trained in first aid and nursing, and were given the duty of supporting the Territorial Medical Service in the event of war. The new units were known as Voluntary Aid Detachments, and those who volunteered were simply called "VADs". Mrs Gjers became Commandant of the local detachment, (Yorks/42), and used her considerable social standing to build it into a strong and effective unit. Her own domestic staff were strongly represented in its ranks, but so were the wives and daughters of local gentry, industrialists, clergy, doctors and tradesmen; it seems everyone seemed to want to "do their bit". We are fortunate to have a photograph of the entire detachment, taken at the rear of the Manor House - see VAD Photo - and as a result of this and the work of the late Miss Seaton we are able to identify the many local men and women who gave of their time and skills in the service of their wounded countrymen. There is evidence from other parts of the service that professional nurses had no respect for the volunteers, and even that some middle-class volunteers looked down on the professional nurses. No such feelings are documented at Stokesley, where Mrs Gjers and her professional Sister (Rachel Grainger) are constantly pictured together. Stokesley's own highly respected Dr Yeoman acted as one of the hospital's medical officers and from the evidence of the letters written by grateful soldiers, the hospital was extremely successful in ministering to its patients. - photos by courtesy of Vicky Tomlinson, grand-daughter of Rachel Crosby Grainger. Unfortunately we have no information as to the identity of the nurses or servicemen shown here. The position and style of the windows seems to indicate that the wards were in the older part of the manor house, demolished after the second world war. - Are these the Belgians mentioned in the local press in October 1914? (See main text, below). The group is posed at the rear of the house, in the corner of the grounds between the North (or Italian) Wing of the manor and the Orangery. Mrs Gjers is in the centre of the front row and Rachel Grainger is 3rd from the left. 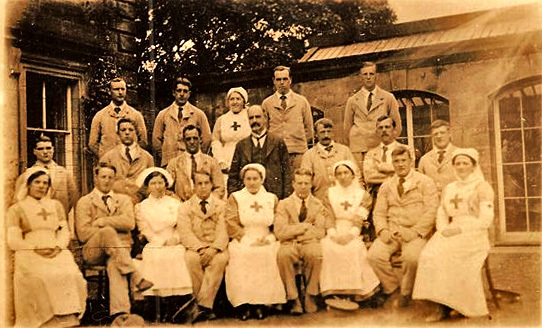 In October 1914 the local press reported that Stokesley Manor had received its first patients, 14 Belgian soldiers. Interestingly, amongst the photographs of staff and patients which survive from the time there is only one (to our knowledge) which shows nursing staff with exactly 14 patients. This may be just a coincidence, but in every other photograph of patients with hospital staff, the patients are in service uniform. The 14 patients shown in this particular picture are not in British uniform and it seems very possible that they are indeed the Belgians. Anne Gjers is seated in the centre of the front row. Behind her stands Dr Yeoman, while Sister Rachel Grainger is seated two places to her right (left in the photo). Mrs Gjers seems to have realised immediately that publicising the work of the hospital was fundamentally important to attracting local support. By releasing stories and articles to the local press, and by reporting regularly in the Parish Magazine, she was able to keep the hospital and its work constantly in the public eye. She made a special point of recording and praising publicly the generosity of supporters, by carefully listing the kinds of help received and the names of donors. One of her newspaper articles is reproduced here, and the number and the variety of the acts of kindness which it records can only be described as truly remarkable. Members of the local gentry provided some very high-class foodstuffs, (including hares and pheasants! ), while local traders gave generously of their stock. Volunteer groups knitted and sewed numerous articles for the use of the patients, schoolchildren collected pennies and locals organised soirees and concerts in aid of the hospital. Medical Officer and Stokesley worthy Dr Yeoman was also a frequent and generous donor, though the cigarettes which usually featured amongst his gifts (and were no doubt much appreciated by the patients of those days) would be frowned on today! We are told that grateful patients sang the praises of the Manor Hospital to their comrades back in the trenches, and even advised them to try to be sent there themselves if they were wounded! 1. Albert Exelby's story is told on this website in the section They Also Served. We would be glad to hear of any others!! !